Invariably, McCain the “maverick”, which was one of his monikers, is being hailed as a “war hero” and “patriot”. A nationwide orchestration of public emotion is underway to elevate a dubious, mean-spirited politician into some kind of saintly statesman. The New York Times trumpeted with its top story: ‘John McCain, War Hero, Senator, Presidential Contender, Dies at 81′. American news channels, from CNN, CBS to ABC and the others, were wall-to-wall in broadcasting misty-eyed venerations of the Arizona senator. McCain, who died from brain cancer at the weekend, was certainly a maverick figure, but hardly in a way that can be ascribed as valorous. Like has-been pop stars whose record sales soar posthumously, so too McCain’s passing proves the adage that “death can be a good career move”. His tawdry, even reprehensible, biographical stock has suddenly become valuable political capital. 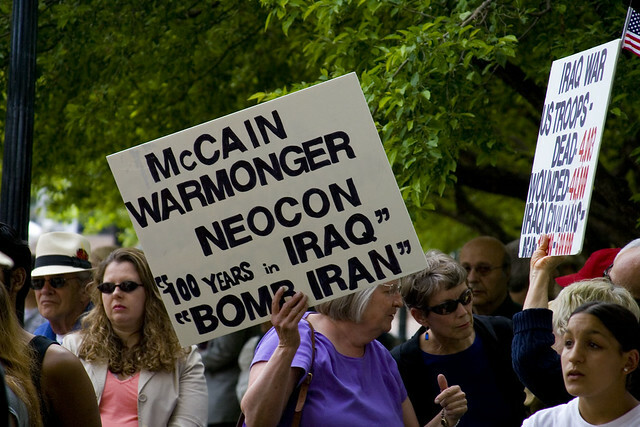 The former Republican senator was one of the most aggressive, warmongering politicians in the US, frequently calling for war or confrontation with Iran, Russia and other foreign nations. Yet this politician whose intemperate words violated international law for inciting war on multiple occasions is now being deified as some kind of honorable elder statesman and paragon of “American virtues”. Another former president, George W Bush, described McCain as “a patriot of the highest order”. What utter balderdash. Two presidents who should be prosecuted for launching criminal wars — from Afghanistan, Iraq to Libya — have the audacity to proclaim McCain a figure of “American ideals”. Of course, the sycophantic American news media indulge this grotesque ritual of embalming a dead politician with lies and falsification. The person they eulogize was a bomber pilot during the Vietnam War and who thus was complicit in the US genocide of millions of Vietnamese. GW Bush — who later waged war on Iraq killing over a million people — and his estimation of McCain as “a patriot of the highest order” have therefore no value whatsoever. Besides when in 1967 McCain was shot down and imprisoned in Hanoi for six years, he reportedly collaborated with the North Vietnamese to reveal classified military information on his aircraft carrier and squadron members. McCain flew an attack bomber jet known as an A-4 Skyhawk. He may have been a hawk in the air above Vietnamese air defenses, but for his captors, he sang like a canary — admittedly after being tortured. McCain was shot down during a bombing raid on a power plant in Hanoi, the North Vietnamese capital. That fact alone, targeting civilian infrastructure, is grounds for a war crime indictment. Not that such a legal nicety ever bothers American war planners and servicemen like McCain. But, in the time-honored fashion of American myth-making, McCain’s dubious record as a prisoner of war in Vietnam has been whitewashed by the US political and media establishment. He is roundly exalted as a “war hero”. That is partly why dying is a good career move for the likes of McCain. Through his death and all the official pious mourning, the long and vile record of American imperialist war crimes is magically transformed into a paean of noble patriotism. McCain’s death is his last service to US imperialism in that it allows a preposterous re-writing of history. Instead of Vietnam and other subsequent wars that McCain supported as a politician being seen as they should be, as outrageously criminal, his media beatification becomes an opportunity to recast those wars as righteous acts of “American idealism”. The other merit from McCain’s death is that it allows the US media to conjure up a supposed virtuous political image with which to attack the sitting Coward-in-Chief, President Trump. Although they shared the same Republican party, McCain was often a critic of the Trump White House. His criticism was not based on any progressive argumentation, such as denouncing Trump over his pro-rich tax policies. McCain was mainly concerned to label Trump a “traitor” because of his willingness to engage normally with Russian leader Vladimir Putin, whom McCain often slandered without any substantiation as a “murderer” and “thug”. By eulogizing McCain as a “patriot”, the anti-Trump news media are trying to set up a standard by which to undermine the president. That standard is, of course, a travesty given McCain’s record of endorsing war crimes. For these reasons, we can expect the next few days to be one of hyper sentimentalism over John McCain. His abhorrent career as a war criminal and an inveterate warmonger is being laundered to reinforce American delusions about the heinous nature of US imperialist power and how it operates in the world. The outpouring of absurd praise is doubly intensified because it also serves as a vent for the obsessive political rivalry against Trump. Dying is a good career move — RIP — for Revamping Imperialist Power. This entry was posted in Imperialism, Politics, War Crimes and tagged Finian Cunningham, John McCain, Vietnam. Bookmark the permalink. McCain was also a carpetbagger, not being from Arizona, and only coming to the state because it was the place he thought he had the best chance of winning a seat in the US House of Representative. McCain was a 35 year blight on the State of Arizona, and the state has little to show from him for those horrible 35 years. Thanks for adding that, Guadamour, I didn’t realize he wasn’t from Arizona.